Huber Woods, Navesink. New Jersey’s a dish, isn’t it? Every year on Thanksgiving I make my family’s recipe for stuffing, eat it in great quantities, then go hiking. (The unfathomably good recipe is here.) This tradition does not vary, because like diamonds and a little black dress, like Valentino and the smoulder, it works. It ain’t broke. But. I had to alter the tradition a bit this year, as I’m still nursing the effects of last month’s scratched food pipe. The stuffing starts with a loaf of crusty Italian bread. When it’s done, it’s spicy, rich, and chewy—the kind of addiction you wouldn’t mind having. And I don’t. How it ought to look. I was disheartened for a good week beforehand because I thought I would have to forgo this dish. But I decided to buck up, and good techie that I am, made a plan: to eat stuffing, somehow, and not have it aggravate my condition. Instead of buying my Italian bread on Monday and letting it go stale on my dining room table until Thursday, I bought it fresh, the day before. Next I pulled the crust from the fluffy white insides—the part I was hoping I could swallow easily—and froze the two portions separately. I also prepped some homemade chicken broth. On Thanksgiving morning I defrosted the bag of bread insides and added it to my pan with the sausage, spices, olive oil, eggs, toasted nuts, and Parmigiano-Reggiano. I ground the dried rosemary with a mortar and pestle so it wouldn’t be too spiky going down. Then I poured broth over the whole thing to make it even more tender. I am not going to lie and tell you that it was delicious. It was decent. The next day it was quite a bit better. But it was more important that I wasn’t uncomfortable, and I wasn’t. I made it work. This was a huge win. Gradations of light and shadow, eastern meadow. Longtime readers know about my love affair with nature—with the wildest parts especially. It is at once a source of serenity and energy for me to leave the paved walkways and cross meadows, hills, glens, groves, the untidy places, the unmanicured country. There is no grass, let alone neatly trimmed grass. The spicy fallen leaves are slippery. I get my ankles tangled in the snarls of vines that cover the rolling ground. Chipmunks, groundhogs, and squirrels dart between thistles. Once I even saw a coyote. I always hope I’ll run into him again. But I hike mostly because I love the feeling of being enveloped by something ancient and unspoiled. It’s like getting massaged on the inside. And I always try to see something I haven’t seen before. A few Thanksgivings ago I found a hidden cemetery, with maybe 30 occupants in all. I always wish them a nice holiday. Last year I found tiny old wooden shacks labeled with numbers—1937, 1938—and I fancied them past years, relegated silently to the woods of Navesink. I could not bring myself to look through the windows and still cannot. This year I found 1929. And also this year, beyond the eastern meadow, I followed a deer path until I was surprised by the shadow of a horse. It stood perfectly still, so I ventured closer to investigate. It was a sculpture, perfectly to scale, and made entirely of driftwood blackened with age. Imagine coming across this with no warning. The afternoon light gets low pretty early these days. I watched it ride the edge of the trees and wondered if I had enough time to look just a little farther. I’d never been beyond the brook at the western end of the woods, and it was tempting. I decided it was getting too late to chance it. Coming across a coyote at nighttime is somewhat less appealing. But here’s the thing. Being sick or injured can make a person want to withdraw and not take chances. God knows it’s happened with me, especially recently. After a month of ping-ponging between my food pipe being okay and being uncomfortable, you can believe I’ve hung back from time to time. If I’m not careful, though, that can become a new habit. Last Thursday I wanted to go farther. I’m so glad I wanted to. It’s a good sign. There are times when I won’t be able to, like this time. But I figure as long as I always want to know what’s beyond the brook, I’m okay. For dinner that night I ate half an Italian sausage, some caramel applesauce I stirred up on the spot (sliced apples with a little butter, brown sugar, and water), and vanilla pudding I’d made the night before. And it was okay again, and I was grateful. The crust from that loaf of Italian bread is sitting tight in my freezer, waiting for another batch of stuffing. It’ll happen. 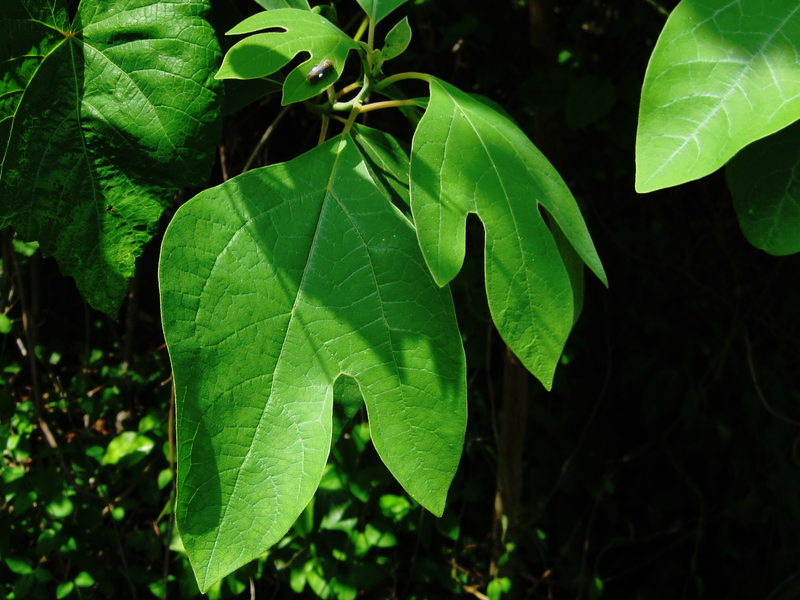 This is sassafras, which apparently makes a delightful root-beer-like drink that I have yet to try. I love going off-roading and picking out plants. Especially the edible ones, because then I can add their location to the ever-increasing list of minutiae in my grey cells, and come back when their season hits. Oh, there’s a blackberry cane, I say to myself; wow, that is one colossal patch of garlic chives. I get a bang out of finding beeches, sycamores, mulberries, crab apples—trees people don’t tend to plant anymore because they’re considered messy. * I know them all well. To me, this isn’t just green stuff sticking out of the grass; it’s friends. I’m serious. Walking through Huber Woods in Locust, NJ last spring, chill as a coconut granita, I thought of how many people I know who are uncomfortable in nature. I don’t mean uncomfortable camping, although the two probably go hand in hand. I mean just walking and bellyaching: ‘This is boring, is that poison ivy, what if a bug looks at me,’ etc. 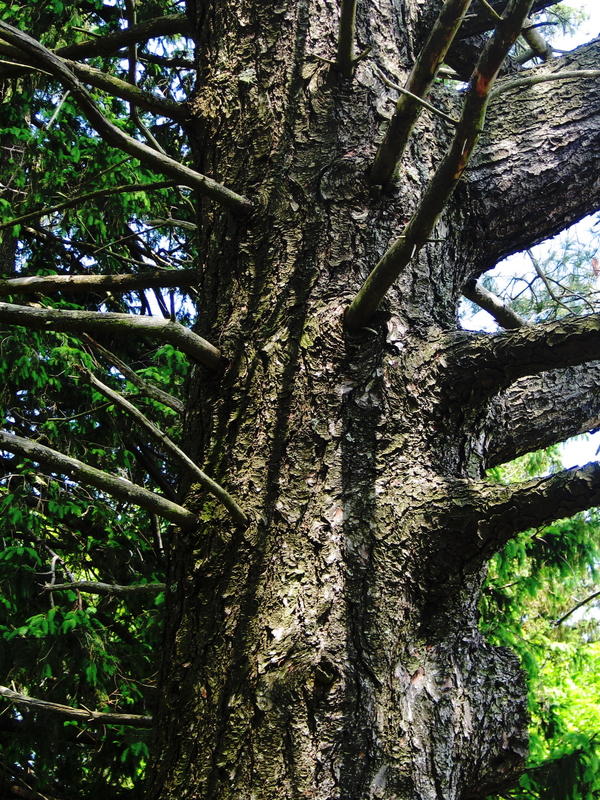 This is a pine tree, easy to discern from other evergreens in that its branches stick straight out like arms, parallel to the others. Did you read the second book in the Wrinkle in Time series, called A Wind in the Door? In it, the characters are in a void and at risk of being ‘X-ed’—that is, wiped out, in Madeleine L’Engle’s cool vernacular. The only way they can be recovered is by what the author calls ‘Naming.’ Heroine Meg figures this out, calls by name everyone out of the void, and saves them all. The Naming re-integrates body, mind, and soul—makes them whole again. And it occurred to me that I had practically grown up outdoors, and moreover had worked at Huber Woods as a naturalist, cuddling snakes, walking-stick insects**, and other assorted beasties. These things, once I knew what they were and learned about them, were as comfortable to me as the eight-year-old mint-green fleece I have on right now. If you know a lot about your surroundings, that makes a giant difference in whether you feel like a granita there, or as nervous as a long-tailed cat in a room full of rockers. Names are powerful. If I can continue being a booky nerd for one more paragraph, let’s remember why John Proctor chooses to walk off to his death at the end of The Crucible. *** He’s happy to lie and say he’s a witch, as long as it’s verbally. But ask him to sign his name to the charges, and that’s where he draws the line. When you attach a name to something, that something gets imbued with power—sometimes for good, like in Meg’s case, or in ill, like in Proctor’s. He didn’t want his name, his very identity, stapled to a lie. 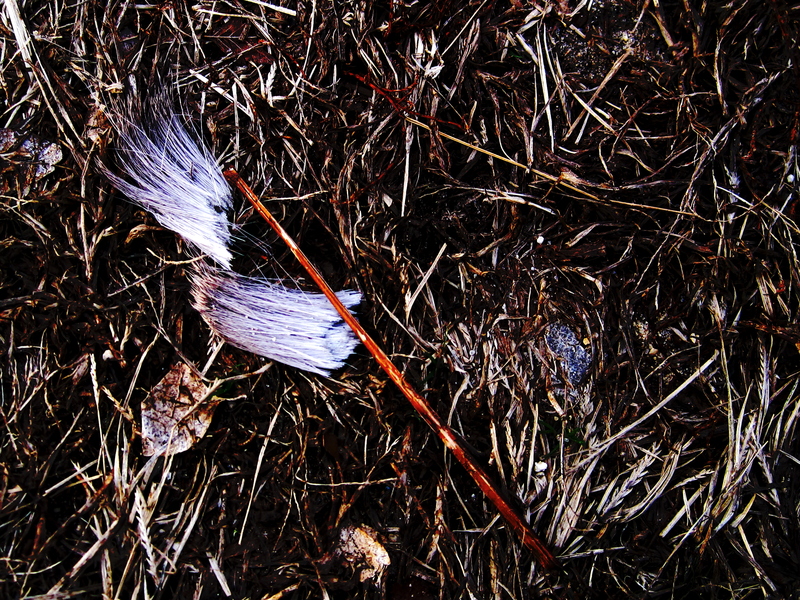 These are tufts of coyote fur. I actually saw one trooping through Huber Woods one day. Told the rest of the nats and they didn’t believe me. But the power of a name is good when it comes to nature. It gives us the ability to discern what’s around us, and can help us to relax. I think of earlier this year, when my friend Laura asked me to check the back of her property to see if she had any poison ivy. She wasn’t freaked out about it or anything; she’s just a gardener who’s out in the grass a lot, and was smart to want to know. And now she knows there isn’t any. I love when my friend Lauren, a talented photographer, shows me a photo she took of a bird and asks its name, or gets excited when I name a flower she shot. She told me when she and her husband (a chef) go on hikes, her husband points out edible plants to their children, and often they all take a nibble. What a profoundly useful gift—to teach the kids to embrace the earth instead of to be afraid of it. Bottom line: we’ve all gotten so detached from the earth that we have no idea what’s around us. Yesterday I picked wild crab apples and a little girl told me she thought they were cherries. Okay—she was three. Fair enough. But an hour later an adult said the same thing to me. Cherries have a brief seasonal window, something like 2-3 weeks, in late spring. In other words, the adult was way off, and I’m sure it’s because supermarkets provide more or less the same produce all year round. I see this as a grave problem, and just goes to show I have a lot more work to do to educate. Not to spit in the eye of Madison Avenue (though I’m certainly not above it), but to re-acquaint, re-familiarize, and encourage people to see and feel and taste what’s growing in its own time. Because right now we’re lost in a void, and it scares me. 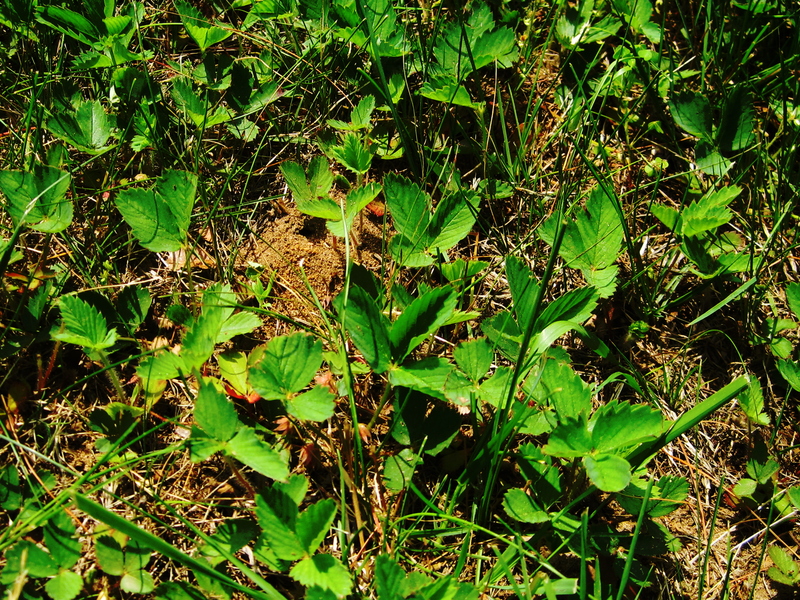 These are wild strawberries (sadly, the ones without much flavor. Yellow flowers pre-berry denote no-flavor strawberries. It’s the white flowers you want for that incredible wild strawberry flavor. They’re my white whale). On your next hike, take a reliable field guide with you. It’s cool, I’m telling you. Look up the plants and animals and birds you see. Name them. And how wild would it be if you Naming them, getting to know them, getting comfortable with them, re-integrates us—helps to make us all whole again? Or along with the field guide, take me along with you. You know I’d totally dig it. This is a groundhog. He and his ilk may look like Sherman tanks but they move like MiG-31 jets. *Wow—made it to Sentence 4 before throwing in an editorial about today’s societal wussiness. Milestone. **Hyperbole. I wouldn’t advise it. They’re really cute, but break easily. ***If you’re under 15 and haven’t read it in school yet: spoiler. Oops.